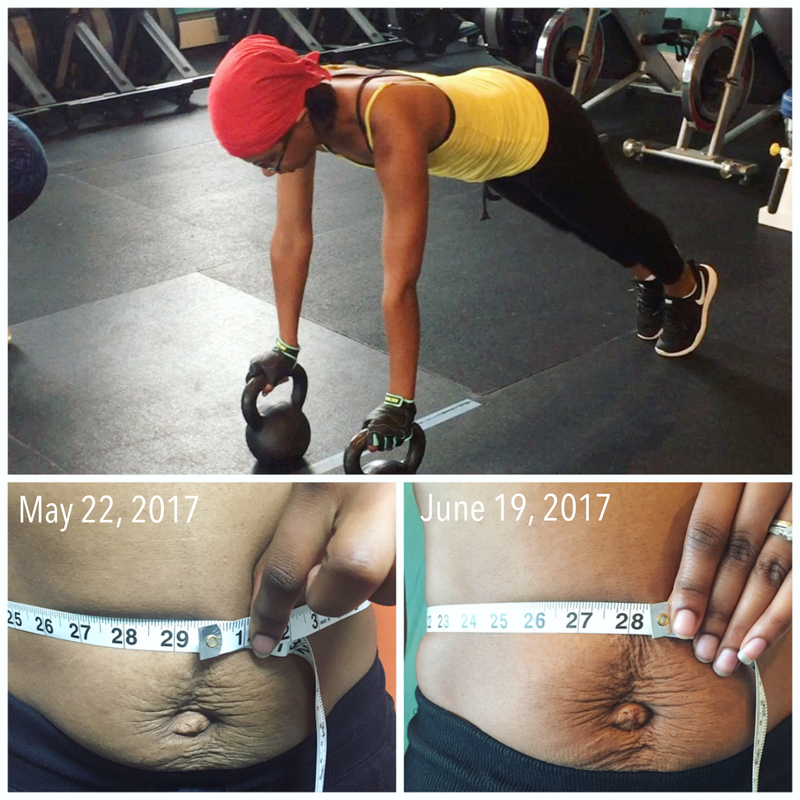 1 Year Postpartum: Strength Training Transformed This Mom! “I discovered Active Moms’ Club three months ago after researching several gyms and realizing that they didn’t offer what I truly needed. I didn’t want to go into a class with twenty people, limited space, and a cookie cutter workout plan. I needed a place where I could feel comfortable with my post-baby body. I also needed a place that would not only address my physical goals but also my social and emotional goals. I was experiencing pelvic pain and I started to feel discouraged about getting my body in shape. I knew I couldn’t do it alone. Kyneitres started Fit & Fab Small Group Training sessions in March, consistently participating in two, one-hour sessions each week. She opted to join in to the 60-Day Summertime Fitness Challenge when it was offered in May, continuing her training twice a week. With the addition of the Challenge she received fitness assessment tests, and specific guidance and accountability for her personal fitness goals—“I want to increase my core strength by addressing my abdominal wall separation and work on core conditioning”. Based on Kyneitres’s personal goal, we also took ’before & after’ pictures, and body measurements at the beginning and end of challenge. 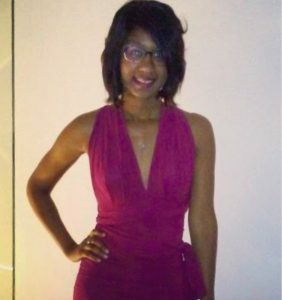 She lost 1.25 inches from her waist, and 2 inches from her hips in just 60 days! More impressive, she crushed her initial fitness assessment test by completing 25% more exercises in allotted time. Being consistent with her workouts, even when she didn’t feel like it, paid off markedly. “The biggest differences I see since starting Fit & Fab Small Group Training would have to be in my abdomen and pelvic region. Those deep belly breaths are truly effective. I suffer from diastasis recti and I’m having to retrain my muscles. It has been challenging but my stomach looks more toned and less like a deflated balloon. I’ve also noticed I’ve strengthened my pelvic area. During my pregnancy I suffered from pretty intense pelvic discomfort that remained after giving birth, even with physical therapy. 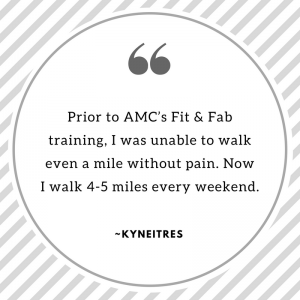 Prior to AMC’s Fit & Fab, I was unable to walk a mile without pain. Now I walk 4-5 miles every weekend. No pain! My husband is amazed. I was struggling to get out of the bed in the morning because the pain was so intense. The difference I see and feel in my mobility is so exciting! What I like most about Fit & Fab workouts is that they are tailored to my needs. I like the small groups. I also like that there is no pressure. Cassandra always provides a welcoming environment. I like that she pays close attention to each moms body and assesses what their strengths and weaknesses are. I like that she develops individualized goals so that the training feels genuine and personal. She is constantly monitoring your growth and strength and making sure the exercises are being performed safely. She is also direct and honest. I’ll admit, I had some delusional thinking and was sometimes trying to perform exercises that my body was not ready for and she made sure to tell me to take it slow and do what is safe for my body and fitness level. In relation to emotional health, it is so nice to be accepted by a group of people who completely understand what it is like to be a new mom. Being able to talk about the uncertainties of motherhood and the anxiety that comes with it all while staying fit is invaluable. What makes me most proud about my new found body shape and strength is the mental and emotional strength I’ve gained. Since starting this journey just three short months ago, I have changed perspectives when it comes to being fit. For me, becoming fit is more about eating healthy, being comfortable with my postpartum body, and just feeling like me again. I feel like I was busy trying to compare myself to my before baby body and it was causing me a lot of mental and emotional stress. I have a new shape and new strength and I’m excited to see how much more I’ll transform. I’m also proud of my ability to stay consistent with my workouts because there were definitely days when I did not feel like going but I did it anyway. Thank you Kyneitres for inspiring me to continue to grow and learn as a trainer, and for inspiring other moms to persevere! Previous PostMom of the Month: Another Inspiring Transformation!